This adventure happened the first time we took out Aussie Escapade, our first boat, the Hartley T16. It was the Easter Holidays 2 years ago, we had purchased Aussie Escapade about 5 months prior and she was finally ready to head out onto the water. We had to borrow my parents car as neither of us had a tow bar on ours. We said it was just for the day so they agreed and off we went. We put the boat in at Cleveland point and decided to head out over toward Stradbroke. We tried with the sails for what felt like 30 minutes to get these things up and finally we were there. We had the music pumping from the cabin, the sun was shining, sails were up, and we were out on the water for the first time. Life was pretty great at this stage. 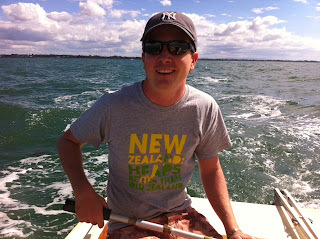 After about 45minutes of sailing we were on our way to Stradbroke Island. I went into the cabin to turn the music up and that's when i noticed most of our stuff starting to float! 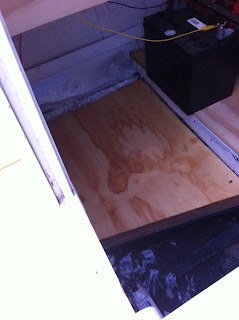 We hadn't screwed all the floorboards back down as we had been water testing it - so yes the floorboards were floating. I scremed out to clinton who told me to put the bilge on (not sure why we didnt already have this on) and start taking the water out with a bucket. Now because the framework was quote narror under the floorboards a bucket wouldnt fit down there. So i used a towel to mop up the water and then run out to the back of the boat and ring it out. I did thing about 20 times and the water was only rising! So Clinton asked me to take over sailing whilst he tried to get rid of the water. Peel island was only about 5 minutes away so I headed for peel so Clinton could assess the damage. We dragged the boat up out of the water (as best we could) and noticed a large hole where we must have missed removing some of the rot. We would have to wait for the tide to go out before we could start repairs. This was going to happen later that afternoon. At this time of the day people were starting to leave Peel Island - as you weren't allowed to stay overnight. One couple came over to see if we needed any help. We replied no however the "friendly" guy insisted he help. He said to us the boat should be facing sideways to the ocean - so Clinton and the "friendly" stranger turned the boat around. As soon as this happen the waves started pouring into the side of the boat along with all the seaweed in Moreton Bay i think! The guy realising he had done a lot more damage then good farewelled us and wished us luck. We were then left to hold the boat until the tide went back out so it didnt get taken out to sea. We stood there for a good 2 hours waiting for the tide to go out so we could patch the boat. Clinton removed some of the wood from inside the boat and used it to patch the hole. We found a role of duct tape in the boat from the previous owner and thought we could use this - we started unrolling only for find about 20cm left of the role! So we used up what we had and the wood and were going to hope for the best. We made a fire on the island - despite all the signs telling us not to. It was Autumn, all our clothes were wet and we weren't getting out of here anytime soon! Most of that night was spent digging a trench around the boat so that when the tide came back in the water didnt come into the boat again - we were going to have to turn her into the ocean. We took about 3 hours to dig the trench around the boat, were were cold and exhausted. We decided to phone Air Sea Rescue and see if they could come and tow the boat - as we weren't ging to risk sailing it again. Air Sea rescue arrived at about midnight and said they could tow us back to Cleveland Point where mum's car was parked. This meant going home to a hot shower and bed - we couldnt have been more excited! After Air Sea Rescue assessed the damage they advised it was too risky to tow back to Celeveland incase it sunk. So they offered to tow us to Stradbroke Island and we had to pay them $250 for helping us. 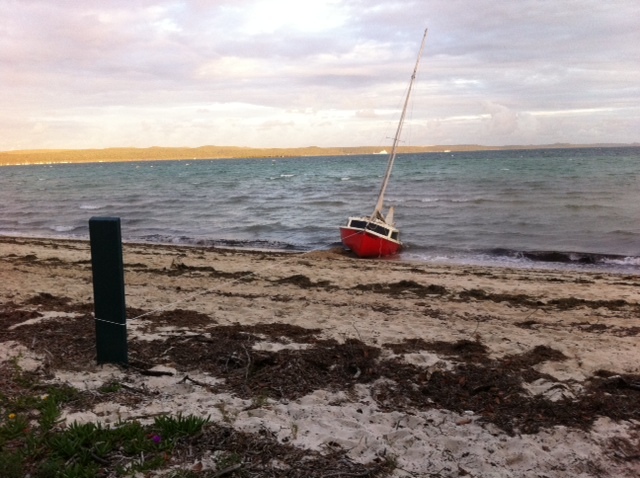 They left us anchored at stradbroke island in a sinking boat. By now the rain had settled in and im not talking about a light shower - this was heavy rain. We could not sleep because the boat was sinking and we took it in turns at removing the water. The boat smelt so bad as all the seaweed was still inside. It felt like forever until daylight. Seeing mum's car was quite a relief (to say the least) however Clinton didn't look too happy when he arrived. He told me that because it was a public holiday we might not be able to get home until Tuesday (today was Sunday) AND the barge had cost him $275! We decided to just line up in the endless rows of cars and hope for a spot on the barge that day. We were in line until 3pm when they finally said we could board. This was seriously one of the best moments of my life. This meant we were heading home to a hot shower, a toilet and bed! $525 lighter and a day later we were finally back home. We had gone through a lot in the past 36 hours and through it all we stayed strong. This will definitely be a great story for the kids!